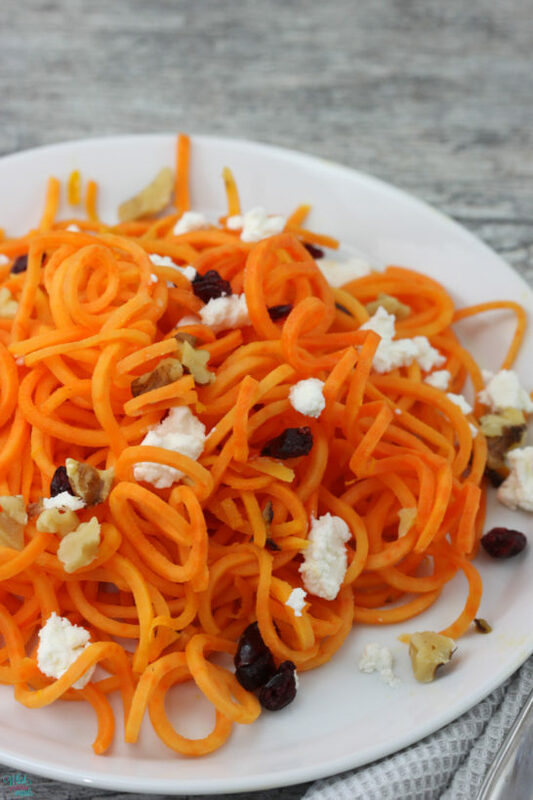 Zoodles are so last year I know, and I was making sweet potato noodles a couple years ago so they are probably out too, maybe? I’m guessing they must be because they didn’t even get a cute name. What would you call them anyways? Poodles, nope. Swoodles? Swepoodles? Yeah forget that, or maybe they will just fall under all the voodles, you know veggie noodles? Oh but they aren’t a veg. Forget the name all I know is whole food noodles weather they are potatoes or veggies they are delicious and delicious fresh whole food is always in style in my house so I’m still rolling with it. 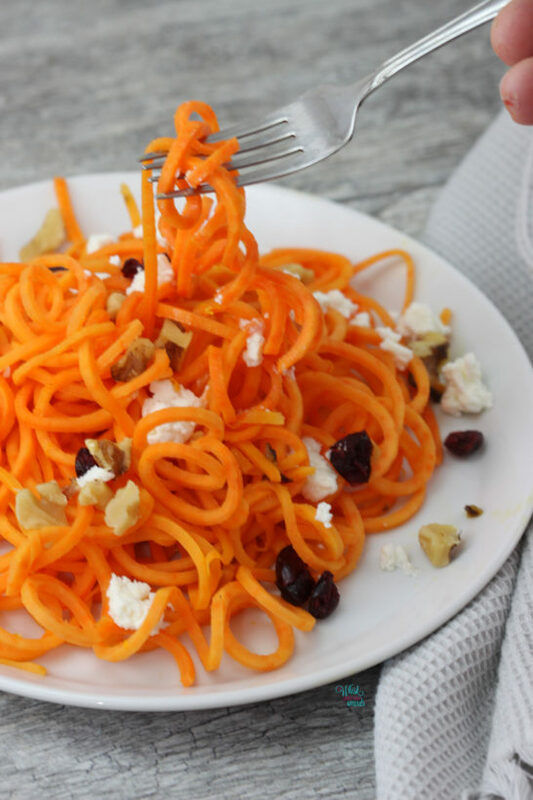 Freshening up sweet potatoes and making them fun I made sweet potato noodles with a splash of orange, balanced with a little onion, walnuts, goat cheese, and cranberries. 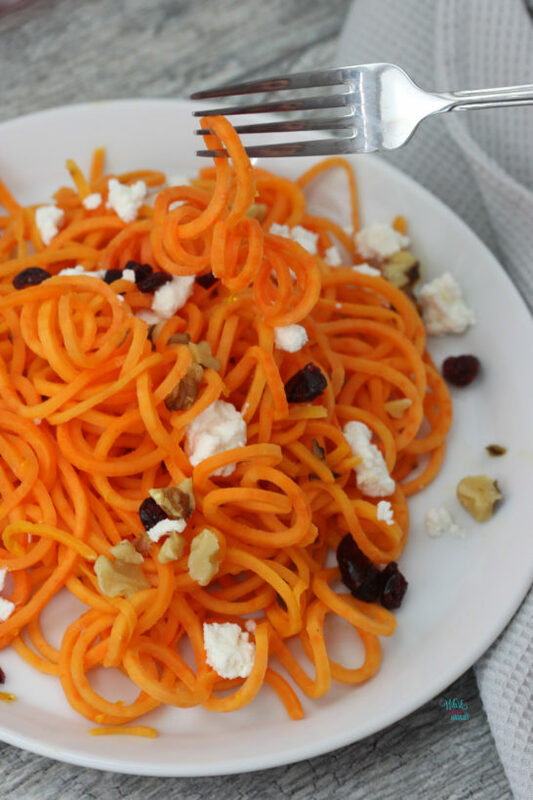 A perfect combo of sweet and savory in a fresh “pasta” that is full of flavor! I like my noodles just al dente with some bite to them but they really only take a few minutes to make so you can throw this meal together quick for a weeknight meal easily in less than 30 minutes. It is also delicious cold the next day, as long as you don’t try to reheat it with the toppings and to keep the nuts crunchy add those in just before eating. Which would also make this a great summer salad side serving cold. 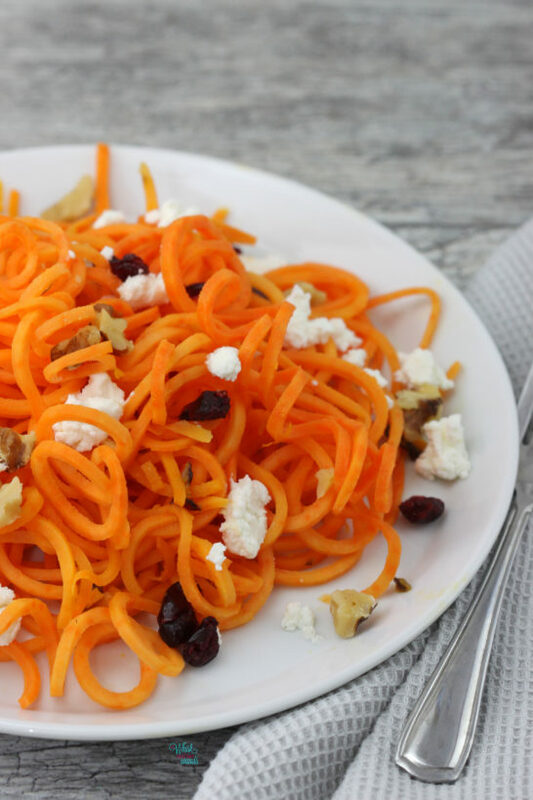 Peel sweet potato and spiralize into noodles with a spiralizer. In a large pan/chicken frier (deep skillet) with a tight lid or a large stock pot if you don’t have a large deep skillet heat oil over medium/high. Add in onion and saute a couple of minutes. Add in sweet potato noodles and cook 4-7 minutes covered on medium, tossing using a pair of tongs every couple minutes, until al dente or as desired. Remove lid and zest in about half the orange, slice orange and squeeze fresh orange juice (cut side up so you don’t get seeds in it) over the noodles and toss. Plate to serve warm, top with crumbled goat cheese, dried cranberries, and walnuts. Or chill and top with crumbed goat cheese, dried cranberries, and walnuts. Enjoy! 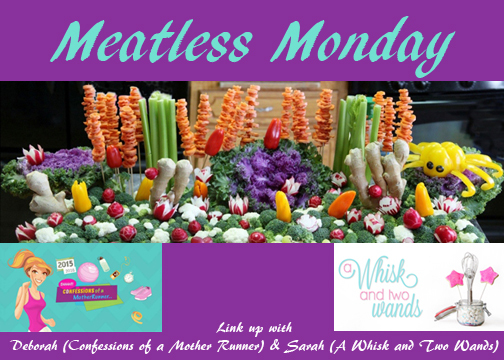 Don’t forget to link up with Deborah and me for Meatless Monday! Sharing and spreading the Meatless Monday love I’m also linking up with The Fit Foodie Mama and Running on Happy! Thank you Angela, and thank you for joining us! Thank you Annmarie, and thank you for joining us! Simply delicious! Oh how fun, yes I see a lot of spiralized veggies in your future! I’m still totally on the zoodle bandwagon! They rock! Thank you! They are still delicious so I’m all about it, or using my mandolin. Thank you for joining us! This combines so many of my favorite foods! I bet the combo of goat cheese with the sweetness of the potatoes is amazing! Thank you Kaila, and thanks for joining us! this looks crazy good. 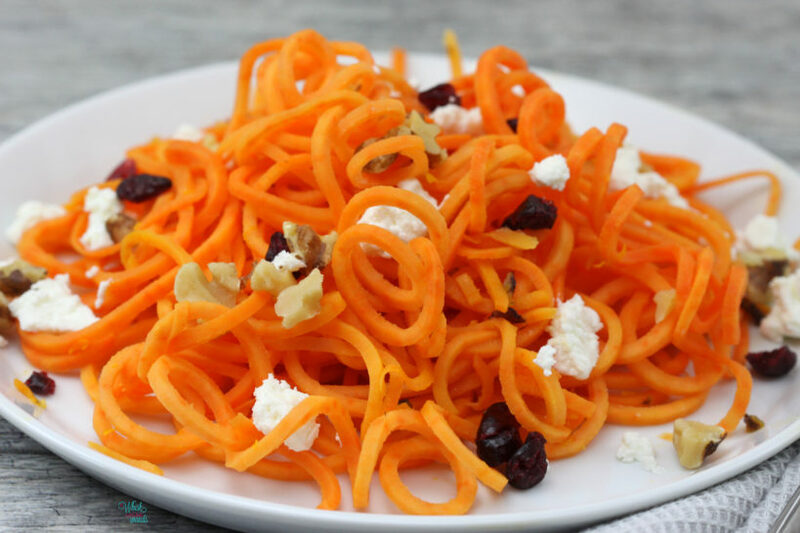 I love finding new recipes to put my spiralizer to good use! Thank you Vicki! This is a quick and easy one to whip up with it, hope you enjoy it!